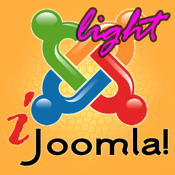 This is the Light version of iJoomla! Have you ever tried to access the backend of your joomla! website? Ok, from your iPhone you can not add articles, change sections, send email, manage your home. Now there is a solution to this! This App faithfully reproduces the most important features of the admin panel of joomla!. * for the complete Article manager use iJoomla! - Enable "Receive System E-mails"